How do you configure Amazon Simple Email Service (SES) to not only send emails, but also to receive email statuses such as sent, delivered, or read? Amazon SES can only receive the status of emails it delivered, but it can't send these statuses to your application. To track them, you need to use Amazon Simple Notification Service (SNS). Configuring Amazon SES and SNS so they work together is quite a challenge especially if you do this for the first time. We explain in details how you can couple these Amazon services with a Scala application using the Amazon SDK. However, the general principle of configuring Amazon SES and SNS equally applies to applications built with other technologies. Let’s dig deeper into the notification flow. First, your application sends an email using Amazon SES and saves the email ID sent back from Amazon SES. The application will use the Amazon SDK to send emails and receive the email ID. Next, Amazon SES dispatches emails to the users. When the email status changes from sent to delivered, read, rejected, or any other status, SES will automatically notify Amazon SNS about the updated status via a topic. Finally, the SNS topic will send a new email status to the endpoints that were registered with the topic. One of the endpoints will be your Scala application. In your application, you'll need to compare the IDs — the stored email ID received from SES with the ID sent by SNS. If the IDs match, then your application will need to update the email status in the database. That's how you’ll be able track the email status. Add the Amazon SDK dependency to your Scala project. Validate the sender email (your email or the company's email) with Amazon SES. 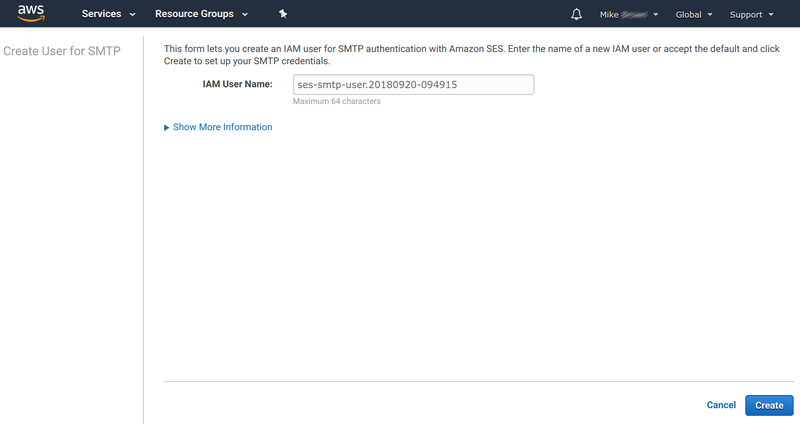 Create a new SMTP user to get credentials for the Amazon SDK. Save the credentials on the server where your Scala application runs. Create a new topic in Amazon SNS and register your endpoints with the topic. Create a new configuration set for SES to connect to the SNS topic. Create a Scala service to handle emailing with SES. Remember that you also need to save the emails' IDs in your database and compare the IDs. How you implement this functionality is up to you, as we'll be focusing on configuring Amazon SES and SNS. We can now start with the first step. After you added the AWS dependency to your project, you can start the next step — verification of the email address (your email or the official email of the company) with Amazon SES that will be used in the field From in emails. After your email is verified, you can proceed to creating a new SMTP user. You need to add the credentials — a login and a password — to your application to be able to connect to the SMTP server and send emails with Amazon SES. The system will automatically generate a name for your SMTP user, but you can enter any name you want (make sure that the name doesn’t include “Amazon”, though). Once you click Create, the console will give you a new login and password for the username you provided. You can click Download Credentials to download a CSV file with your SMTP Username and SMTP Password. Don’t leave the page unless you saved the login and password in a separate document. You won't be able to view these details again, and you’ll have to create a new SMTP user if you didn't save them. Once you have the credentials, you need to save them on the server or development computer where you run your Scala application. The initial setup of Amazon SES is complete, and you can start configuring Amazon Simple Notification Service. As we discussed in the overview section, Amazon SES requires a topic that it will notify about new email statuses. The topic will contain a list of the API endpoints to receive the statuses. After creating a topic, you need to register your endpoints with the topic. Before your application is able to get any notifications from the topic you've created, it's necessary to add at least one endpoint to which the notifications must be sent by SNS. Adding an endpoint in Amazon terms is called creating a subscription. In this window, specify the protocol (HTTP or HTTPS as used by your application) and also the endpoint, for example, a URL https://my-website.com/ask-me-here, to which Amazon SNS will connect. Remember to also create a handler for the endpoint in your Scala application. You can create a very simple handler for now as it's enough to just log the confirmation message from Amazon SNS into the console. 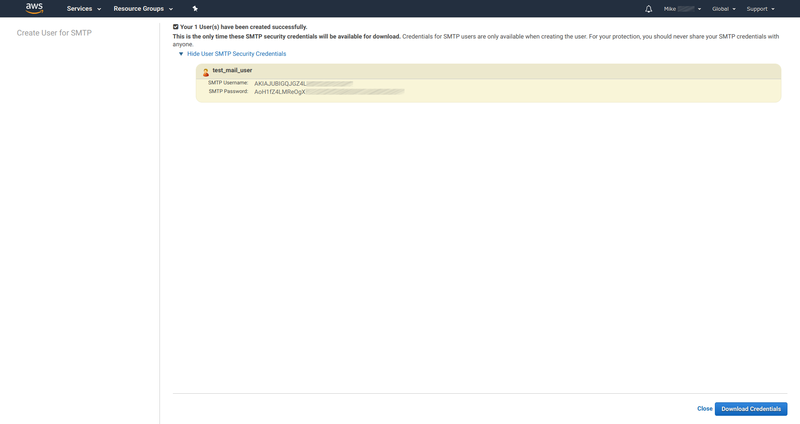 After you've added an endpoint, Amazon SNS will send a confirmation message to the endpoint you specified. If you didn’t receive the SubscriptionConfirmation message from Amazon SNS (in other words, you forgot to add a handler before sending a confirmation), you can repeat the confirmation request. For that, check the box for the endpoint in the list and then click Request confirmations (the button is always active for the subscriptions that you didn’t confirm). You'll need to open the link that’s stored in the property SubscribeURL in your browser to confirm the subscription. Since you only need to confirm the subscription only once, there’s no need to parse this message or add other complicated logic. You can just manually copy the link and paste it into the address bar of your browser. Simple Notification Service is ready to send notifications once the subscription is confirmed. In the following section, you'll be testing the topic you've created. You can test the connection to Amazon SNS in a simple way. First, you should rework the controller for the endpoint you provided for the topic. This controller will get messages from Amazon SNS with the email ID and status. This message in the JSON format will contain a unique message ID and also the event type with the current status of the email. The ID will be identical to the ID of the email that you saved in the database. You can try out a different format for messages from Amazon SNS. For that, you need to check the box for the subscription you've created, and then click Other Subscription Actions to open the list of options. Next, select Edit subscription attributes from the list. Finally, check the box Raw message delivery and confirm changes by clicking Set subscription attributes. As you’ve added and tested a topic in Amazon SNS, it’s necessary to create a new configuration set with that topic in the SES dashboard. Using a configuration set, you’ll be able to determine what information about the emails SES will be sending to the topic. Let’s add a configuration set. First, open the Configuration Sets tab in the Simple Email Service dashboard. In the screenshot below, you can see a list of configuration sets with only one entry named status. To create your own configuration set, click Create Configuration Set. You'll see a popup, where you can add a name for the set. After that, click on the Create Configuration Set button in the popup. Once the configuration set is added, you'll see it in the list. Just creating a configuration set isn't enough, though, for connecting Amazon SES and SNS. You’ve finished configuring Amazon SES and SNS. Next, you need to create a service in your Scala application to send emails. It's time to create a service in your Scala application to send emails. 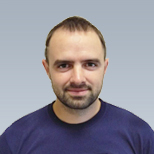 The service uses Amazon SDK classes and methods to create and send emails. You can view the Java implementation in the Amazon SES documentation. val DEFAULT_BODY = "Hello! This is the test message." * Name of the configuration set created in Amazon SES for Amazon SNS. * The Amazon SES client that will send emails. Set the region to your region. * Setting up email messages. * Optional code that allows you to add a file to emails. Let’s break this long code example into meaningful chunks and review them. First, you need to initialize several constants for the emails. At the very least, you need to set the sender, body, subject, and receiver. Additionally, you can set a path to a file that you'll sent with emails. If you don't need to attach files to emails, you may delete the DEFAULT_FILE_PATH constant. You also need to create a session for sending emails, as required by Amazon SDK. The session will be used as a parameter when instantiating a new message (an email). The code below will create an instance of Amazon SES Client. Remember to specify the region in which your SMTP server is located. You can find your region in the AWS Console. In the SES dashboard, open SMTP Settings and find Server Name. The server name for your application will look similar to this: email-smtp.us-west-2.amazonaws.com. You need to use the middle part — us-west-2 — in your application, as shown in the example (note that in the application code the region is written in capital letters, and that dashes are replaced with underscores). Amazon provides more information about the regions in a dedicated document in their developer guide. // Create a multipart "alternative" child container. // Create a wrapper for the HTML part. * the subparts are embedded images. After you’ve created and configured the email you’re going to send, add a try block that will send emails. Note the line result.getMessageId. When you call the sendMessage() method, it'll return an email ID. Remember that you’ll need to save the ID manually in your code when you call this method. You’ve completed the setup of the service. Now Amazon SES and SNS can work together and let you track the email status with your Scala application. And you can learn even more details about SES and SNS in the Amazon developer guides. Let’s also review one last aspect of sending emails with Amazon SES. You may also want to track if your emails are blocked by spam filters. For that, Amazon offers to use the SES Reputation Dashboard. 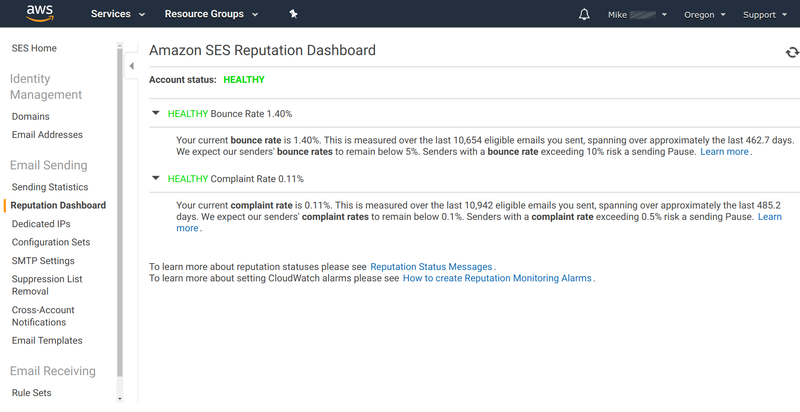 In the Reputation Dashboard, you can view such data as the bounce and complaint rates. 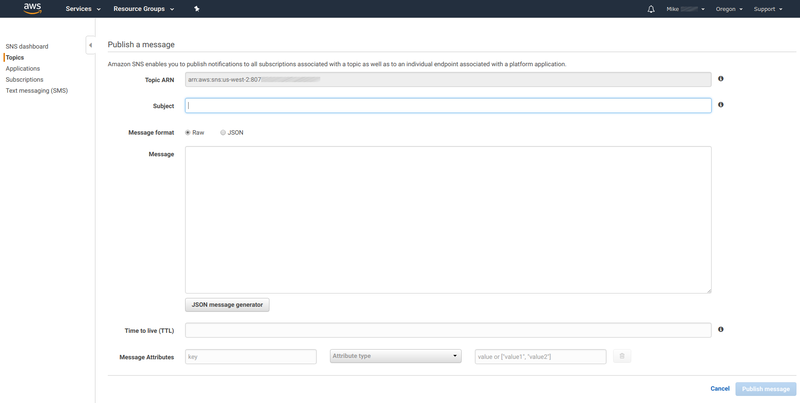 Now your Scala application can send emails using Amazon SES and track the status of sent emails with the help of Amazon SNS.